Thalia Getaway is only 10 minutes out of Murray Bridge, making it a short drive if you want an evening off from cooking to Journey into town to try the local cuisine. One of the great things about Murray Bridge is that it still retains that wonderful Australian Country town feel, and synonymous with this is the Country Town Hotel. 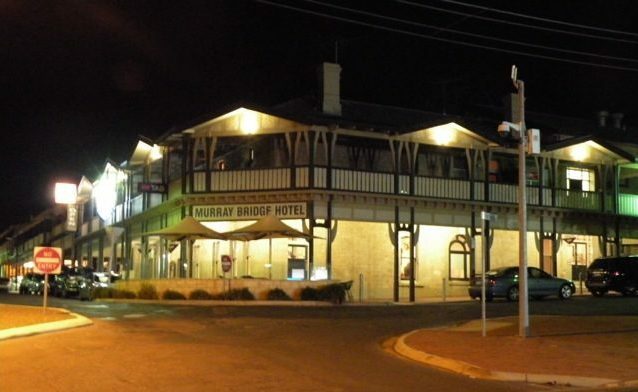 The Murray Bridge Hotel dates back to 1914 and retains all of its original charm. Located on Sixth Street not far back from the Murray River stands this Majestic old Hotel. It epitomizes the Australian country Pub. With its 2 storey construction and return verandahs it is every thing a country Pub should be. Today its managed by Karen & Rob Milesi who take a hands on approach to the day-to-day operation of the hotel. They are clearly keen to maintain the hotels reputation. The food is no acceptation, the menu offers a broad selection from the traditional Ozzie Parma’s to pastas, seafood and of course Roast’s. I can highly recommend their Penta’s Lamb pie. All meals come with a helping from the buffet that offers a good range of salads and traditional hot vegetables. The main meals are available in two sizes medium and large, there is a children’s menu available too. It has to be one of the last Hotels that still give’s you a bread roll at no extra charge when you sit down at your table. Be warned it is very popular with the locals; so be sure to book a table to avoid disappointment.